Charming and private, Villa UJV 318 is located on the Mont Jean hillside, St Barts, with views toward Pointe Milou and Marigot Bay. The villa offers 5-bedrooms when combined with a separate cottage at the entrance to the property. Built mainly on one level, villa UJV 318 accented with tropical colored fabrics has traditional terracotta floors and white wood walls which create a pleasing, island elegance. The air-conditioned living room, furnished with beautiful antique pine armoires and overstuffed sofas, opens to a beautiful ocean view. 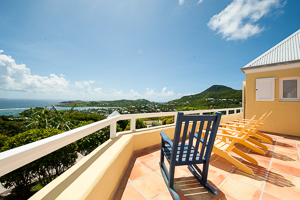 There is a balcony to enjoy the magnificent views and the frequent the trade winds. In the heart of the villa, on a covered terrace, there is an open-air living area with rattan furniture and bright colored cushions. The second guest bedroom is medium sized and is recommended for teenagers or children. The master suite is located off the lower pool area and is the largest bedroom offering a dressing room, office, and private terrace, which opens to the garden and the view. This bedroom is truly wonderful and gives the impression of a luxury yacht with its polished floors and the elegant, refined décor based on the ever-changing colors of the sea and sky. The one bedroom cottage hast a light, bright and airy living area surrounded with large sliding French doors, which open onto the private, covered dining terrace and adjacent heated spa. The cottage is equipped with state-of-the-art music, DVD and flat screen television. The linens are of a refined sumptuous quality fit for a king or queen. The adjoining bathroom is gorgeous and has an outdoor shower and a tree that was carefully preserved when the cottage was built. The villa has mature gardens with a little path leading up to a new pool, pool deck, and barbecue area with a view of Pointe Milou and St Martin. Villa UJV 318 is the perfect villa for that long awaited holiday.